Ferroelectric materials have received strong interest for applications in electronic sensors, memories, and switching devices. In this context, fast and controlled changes of their electric properties are essential for implementing specific functions efficiently. This calls for understanding the connection between atomic structure and macroscopic electric properties, including the physical mechanisms governing the fastest possible dynamics of macroscopic electric polarizations. 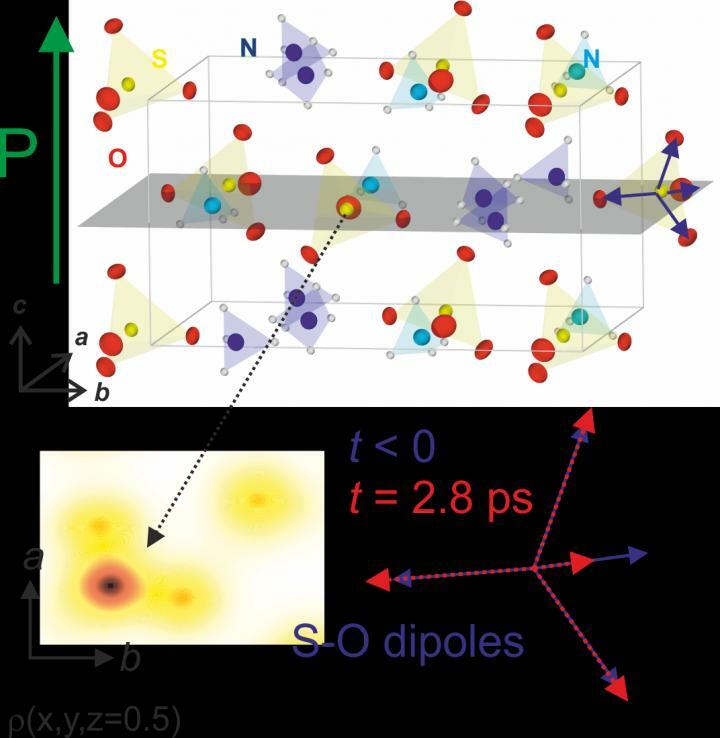 Researchers from the Max Born Institute in Berlin have now demonstrated how atomic vibrations modulate the macroscopic electric polarization of the prototype ferroelectric ammonium sulphate [Fig. 1] on a time scale of a few picoseconds (1 picosecond (ps) = 1 millionth of a millionth of a second). In the current issue of the journal Structural Dynamics [5, 024501 (2018)], they report an ultrafast x-ray experiment which allows for mapping the motion of charges over distances on the order of the diameter of an atom (10 to the power of minus 10 m = 100 picometers) in a quantitative way. In the measurements, an ultrashort excitation pulse sets the atoms of the material, a powder of small crystallites, into vibration. A time-delayed hard x-ray pulse is diffracted from the excited sample and measures the momentary atomic arrangement in form of an x-ray powder diffraction pattern. The sequence of such snapshots represents a movie of the so-called electron-density map from which the spatial distribution of electrons and atomic vibrations are derived for each instant in time ([Fig. 2], [Movie on MBI website, https://www.mbi-berlin.de/en/current/index.html#2018_04_12 ]). The electron density maps show that electrons move over distances of 10 to the power of minus 10 m between atoms which are more than a thousand times larger than their displacements during the vibrations [Fig. 3]. This behavior is due to the complex interplay of local electric fields with the polarizable electron clouds around the atoms and determines the momentary electric dipole at the atomic scale. Applying a novel theoretical concept, the time-dependent charge distribution in the atomic world is linked to the macroscopic electric polarization [Fig. 3]. The latter is strongly modulated by the tiny atomic vibrations and fully reverses its sign in time with the atomic motions. The modulation frequency of 300 GHz is set by the frequency of the atomic vibrations and corresponds to a full reversal of the microscopic polarization within 1.5 ps, much faster than any existing ferroelectric switching device. At the surface of a crystallite, the maximum electric polarization generates an electric field of approximately 700 million volts per meter.